To top off my experience in the Motel from Hell, when I checked out the desk clerk tried to charge me $10 more than the rate I had been quoted the night before. That was a short discussion, since he couldn't have extracted five more cents from me without pulling a gun or a knife. I couldn't wait to leave this dirty, humid, dangerous shithole - the motel and the city. US 90 took me over the Mississippi near downtown New Orleans, leaving town on a bridge which proudly proclaimed that it was built during the administrations of Huey P. Long and Oscar K. Allen. But despite the large number of "interesting" street names taken from common English words instead of people and places, I wasn't the least bit tempted to visit. Instead I followed the road over another big bridge proclaiming that it was erected during the Administrations of Huey Long and his successor, eventually clearing the metropolitan area for a cruise through bayou country. West of Houma, 90 became a two-lane road following a bayou past numerous small towns, some of which offered swamp cruises. French names dominated the landscape almost all the way to Lake Charles. My one significant stop was Shadows-on-the-Teche, an antebellum house in New Iberia now owned by the National Trust for Historic Preservation. 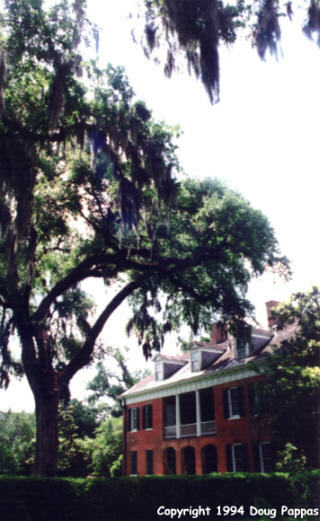 The grounds contain a half-dozen huge trees (oaks?) which overhang and dominate the property. The house itself isn't large by antebellum standards, and the tour (as usual) seemed about 50% too long, but it was a nice break. Continued west, mostly on two-lane roads, until I approached the Texas border. Four miles short of the border, 90 was funneled back onto I-10, where it remained for 25 miles; 80 miles later, outside Houston, it rejoined the Interstate for the trip through town. From Lake Charles west to Houston, it was clear I was in oil country, but the scenery and atmosphere changed as soon as I crossed the Texas line. The land abruptly seemed less swampy and more open, with fewer trees and a "Western" style of architecture. At Beaumont, I stopped to visit the visitor center near the Interstate, which contains a museum honoring native daughter Babe Didrikson Zaharias, the century's greatest woman athlete. In 1932, the 18-year-old Babe won five events at the U.S. Olympic trials, singlehandedly outscoring every other team, then won two gold medals at the Los Angeles Olympics. Didrikson played semipro baseball against men and was named a basketball All-American three times before she turned her attentions to golf. As a golfer, she won eighty amateur and professional championships in 18 years before succumbing to cancer, aged only 42. The museum has all her memorabilia, but not nearly enough historical context. I continued along 90 as it became a four-lane road towards Houston. The day's last stop: a detour to the San Jacinto monument southeast of Houston, a few miles off the Interstate. Seven weeks after the massacre at The Alamo, Texans got their revenge when troops commanded by General Sam Houston defeated the Mexican army to win independence for Texas. In typical understated fashion, Texas commemorated the centennial of the Battle of San Jacinto by erecting a granite obelisk taller than the Washington Monument, crowned by a 35' Lone Star. 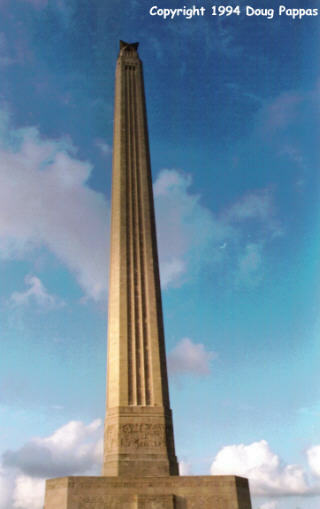 The base of the monument houses a museum and an elevator to the observation deck, which offers a less-than-inspiring view of the Houston ship channel; the exterior of the base is inscribed on all four sides with an endless account of the battle for Texan independence. Then returned to 90, which eventually linked up with I-10 for the drive through downtown Houston. I stopped for the night at a motel on the west side of town -- not a Family Inn.